Moscow. April 14 (Russia Today):The Russian Ministry of Defense said that the Syrian Defense System had intercepted 71 of the 103 missiles fired by Allied aircraft on targets on Damascus and other areas which were allegedly centers involved in chemical warfare. The invading aircraft deliberately avoided Russian military installations to avoid escalation of the conflict. The US said that the airstrike on Friday was a one off attack. Cruise missiles targeted Al-Dumayr air base east of Damascus, according to the Russian military. The Syrians used Soviet-made S-120, S-200 and Buk-type anti-aircraft systems, claiming to have intercepted all the missiles. Damascus harshly condemned the bombing, saying it will never bow to the West’s attacks on its sovereignty. Syria’s UN envoy, Bashar Jaafari, accused the US, UK, and France of blatantly violating the UN Charter. “I would clarify here that the history of these three states is built on using lies and fabricated stories to wage wars in order to occupy states, seize their resources, and change governments in them by force,” he said, as cited by Syria’s SANA news agency. The timing of the American-British-French attack is noteworthy. It came just hours before the UN’s Organization for the Prohibition of Chemical Weapons (OPCW) experts were set to visit the Damascus suburb of Douma on Saturday to establish whether chemical weapons had been used there last week. 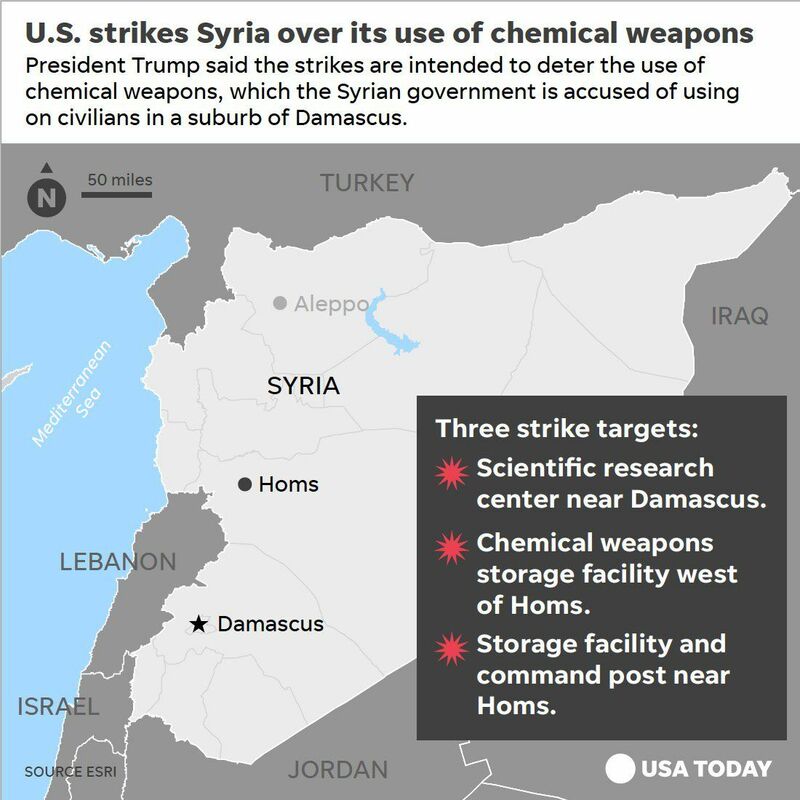 Announcing the strikes, the White House said it has a large body of“reliable intelligence”as well as“social media users, non-governmental organizations, and other open-source outlets,” which implicate the Syrian government in the alleged Douma attack. Earlier, the US State Department claimed to have proof that the Syrian government was behind the alleged chemical attack in Douma. However, itrefusedto make the intelligence public, as“a lot of this stuff is classified at this point.”Moscow repeatedly dismissed the claims, saying the chemical weapon attack was orchestrated. The Russian military previously warned of a“provocation”involving chemical weapons being planned by militants. Later in the day, the French military released what appears to be a declassified intelligence claiming Syria concealed some of its chemical weapon stockpiles and capabilities from the Organization for the Prohibition of Chemical Weapons in October 2013. The report also said that French intelligence services analyzed“testimonies, photos and videos that appeared spontaneously on special websites, in the media and on social networks”in the hours and days that followed the attack in Douma. Multiple targets in Syria were bombarded by the US, UK, and France in retaliation to what they said was an Assad-orchestrated chemical attack near Damascus. Here are the main facts about the intervention. Washington approved “precision strikes” against Syria early on Saturday, alongside British and French forces that also took part in the bombing. Shortly after US President Donald Trump announced the bombardment, reports began surfacing of explosions in Damascus. 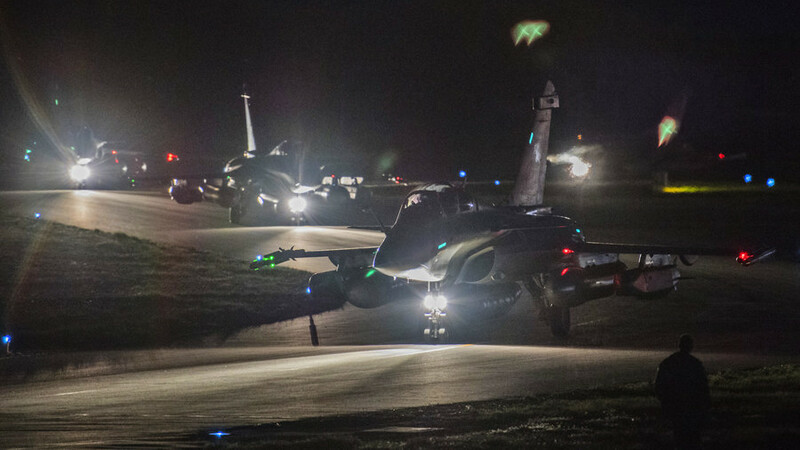 Now, as Syria deals with the aftermath of the early morning airstrikes, we look at five major things you should know about the American-British-French attack. One of the strikes targeted a scientific compound in Barzeh in the vicinity of Damascus, which the coalition claimed was involved in the production of chemical and biological weapons. But the Syrian government said the bombing destroyed an education center and scientific laboratories, but resulted in no casualties. The UK Defense Ministry said four Royal Air Force Tornado GR4s launched Storm Shadow missiles at what the UK military claims was a former missile base, 15 miles west of Homs. The ministry claimed that the Syrian government kept a stockpile of chemical weapons precursors at the site. The Russian Defense Ministry said the US and its two allies deployed combat aircraft and warships to launch over 100 cruise missiles and air-to-surface missiles on Syrian civil and military facilities. The strikes, it said, were conducted by two US ships traversing the Red Sea, adding that the coalition also deployed B-1 Lancer strategic bombers and arranged tactical air support in the airspace over the Mediterranean. While none of the cruise missiles launched by the US and its allies reached the Russian air defense zones, the strikes sparked outrage in Moscow. In a statement posted on Facebook, she compared the invasion to the start of the 2003 Iraq War, which was based on claims that Iraq was developing weapons of mass destruction. The defense ministry said the Russian forces did not deploy their air defense systems stationed in Syria to intercept the American, British, and French missiles. For its part, Chairman of the Joint Chiefs of Staff General Joseph Dunford said the Pentagon “specifically identified targets“to “mitigate the risk of Russian forces being involved.” The coalition did contact their Russian counterparts to“deconflict airspace,”but did not“coordinate targets” with Moscow.